When a wildfire rages through a forest in Northern Canada, Alaska or Russia, prevailing winds blow its toxic emissions north to the Arctic. As climate change brings warmer, drier summers to the world’s boreal forests, fires are getting bigger and more frequent. What does this mean for the atmosphere at the top of the world — and for the rest of the planet? Erik Lutsch, a PhD student in the department of physics at the University of Toronto, is part of a team that’s looking for the answers. 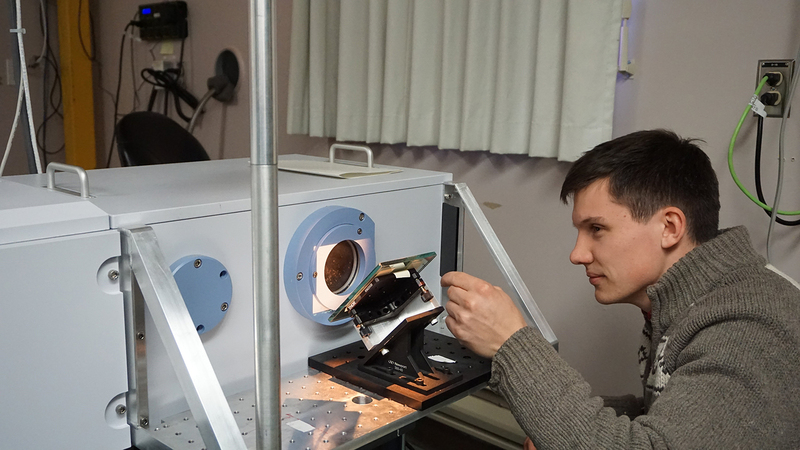 Thousands of kilometres north of the nearest tree, Lutsch sets up the spectrometer he’ll use to scrutinize the polar sunlight for chemical traces of burning forests. In February, just before the sun returns to the High Arctic, Lutsch and his atmospheric research colleagues fly north to the Polar Environment Atmospheric Research Laboratory (PEARL) at Eureka, Nunavut. There, thousands of kilometres north of the nearest tree, Lutsch sets up the spectrometer he’ll use to scrutinize the polar sunlight for chemical traces of those burning forests. Lutsch’s unique data from the High Arctic is helping researchers learn how fires affect air quality and climate. It’s also an essential link in the worldwide network of environmental monitoring by scientists from many disciplines who are striving to understand the Earth’s complex interplay of atmosphere, land, oceans, snow, ice and living organisms, and to design computer models to predict how these relationships may change in the future.